For the film and television composer, see Arthur B. Rubinstein. For the Russian musician (1829-1894), founder of the Saint Petersburg Conservatory, see Anton Rubinstein. For the Russian musician (1835-1881), founder of the Moscow Conservatory, see Nikolai Rubinstein. Arthur Rubinstein KBE OSE GOSE (Polish: Artur Rubinstein; 28 January 1887 – 20 December 1982) was a Polish American classical pianist. He received international acclaim for his performances of the music written by a variety of composers and many regard him as the greatest Chopin interpreter of his time. He has been described as one of the greatest pianists of the twentieth century. He played in public for eight decades. Rubinstein was born in Łódź, Congress Poland (part of the Russian Empire for the entire time Rubinstein resided there) on 28 January 1887, to a Jewish family. He was the youngest of seven children of Felicja Blima Fajga (née Heiman) and Izaak Rubinstein. His father owned a small textile factory. Rubinstein's birth name was to be Leo, but his eight-year-old brother claimed that "His name must be Artur. Since Artur X (a neighbour's son) plays the violin so nicely, the baby may also become a great musician!" And so he was called Artur, although in English-speaking countries, he preferred to be known as Arthur Rubinstein. His United States impresario Sol Hurok, however, insisted he be billed as Artur, and records were released in the West under both versions of his name. At age two, Rubinstein demonstrated perfect pitch and a fascination with the piano, watching his elder sister's piano lessons. By the age of four, he was recognised as a child prodigy. His father had a predilection for the violin and offered Rubinstein a violin; but Rubinstein rejected it because he thought his instinct was for harmony and polyphony. The Hungarian violinist Joseph Joachim, on hearing the four-year-old child play, was greatly impressed, telling Arthur's family, "This boy may become a very great musician—he certainly has the talent for it... When the time comes for serious study, bring him to me, and I shall be glad to supervise his artistic education." On 14 December 1894, seven-year-old Arthur Rubinstein had his debut with pieces by Mozart, Schubert and Mendelssohn. When he became ten years of age, Rubinstein moved to Berlin to continue his studies, and gave his first performance with the Berlin Philharmonic in 1900, at the age of 13. Joseph Joachim recommended Karl Heinrich Barth as the boy's piano teacher. As a student of Barth, Rubinstein inherited a renowned pedagogical lineage: Barth was himself a pupil of Liszt, who had been taught by Czerny, who had in turn been a pupil of Beethoven. In 1904, Rubinstein moved to Paris to launch his career in earnest, where he met the composers Maurice Ravel and Paul Dukas and the violinist Jacques Thibaud. He also played Camille Saint-Saëns' Piano Concerto No. 2 in the presence of the composer. Through the family of Juliusz Wertheim (to whose understanding of Chopin's genius Rubinstein attributed his own inspiration in the works of that composer) he formed friendships with the violinist Paul Kochanski and composer Karol Szymanowski. Rubinstein made his New York debut at Carnegie Hall in 1906, and thereafter toured the United States, Austria, Italy, and Russia. According to his own testimony and that of his son in François Reichenbach's film L'Amour de la vie (1969), he was not well received in the United States. By 1908, Rubinstein, destitute and desperate, hounded by creditors, and threatened with being evicted from his Berlin hotel room, made a failed attempt to hang himself. Subsequently, he said that he felt "reborn" and endowed with an unconditional love of life. In 1912, he made his London debut, and found a home there in the Edith Grove, Chelsea, musical salon of Paul and Muriel Draper, in company with Kochanski, Igor Stravinsky, Jacques Thibaud, Pablo Casals, Pierre Monteux and others. During World War I, Rubinstein stayed in London, giving recitals and accompanying the violinist Eugène Ysaÿe. In 1916 and 1917, he made his first tours in Spain and South America where he was wildly acclaimed. It was during those tours that he developed a lifelong enthusiasm for the music of Enrique Granados, Isaac Albéniz, Manuel de Falla, and Heitor Villa-Lobos. He was the dedicatee of Manuel de Falla's Fantasía Bética, Villa-Lobos's Rudepoêma and Stravinsky's Trois mouvements de Petrouchka. Rubinstein was disgusted by Germany's conduct during the war and never played there again. His last performance in Germany was in 1914. In the autumn of 1919 Rubinstein toured the British provinces with soprano Emma Calvé and tenor Vladimir Rosing. In 1921 Rubinstein gave two American tours, travelling to New York with Karol Szymanowski and his close friend Paul Kochanski. In 1934, the pianist, who stated he neglected his technique in his early years, relying instead on natural talent, withdrew from concert life for several months of intensive study and practice. Rubinstein toured the United States again in 1937, his career becoming centered there during the World War II years when he lived in Brentwood, California. He became a naturalized US citizen in 1946. During his time in California, Rubinstein provided the piano soundtrack for several films, including Song of Love with Katharine Hepburn. He appeared, as himself, in the films Carnegie Hall and Of Men and Music. Although best known as a recitalist and concerto soloist, Rubinstein was also considered an outstanding chamber musician, partnering with such luminaries as Henryk Szeryng, Jascha Heifetz, Pablo Casals, Gregor Piatigorsky and the Guarneri Quartet. Rubinstein recorded much of the core piano repertoire, particularly that of the Romantic composers. 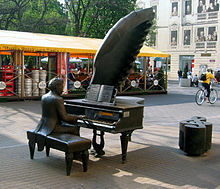 At the time of his death, The New York Times in describing him wrote, "Chopin was his specialty ... it was [as] a Chopinist that he was considered by many without peer." With the exception of the Études, he recorded most of the works of Chopin. In 1964, at the height of the Cold War, he gave a legendary concert in Moscow, with a pure Chopin program. He was one of the earliest champions of Spanish and South American composers, as well as French composers of the early 20th century (such as Debussy and Ravel). In addition, Rubinstein promoted the music of his compatriot Karol Szymanowski. Rubinstein, in conversation with Alexander Scriabin, named Brahms as his favorite composer, a response that enraged Scriabin. By the mid-1970s, Rubinstein's eyesight had begun to deteriorate. He retired from the stage at age 89 in May 1976, giving his last concert at London's Wigmore Hall, where he had first played nearly 70 years before. Rubinstein, who was fluent in eight languages, held much of the repertoire (and not only that of the piano) in his formidable memory. According to his memoirs, he learned César Franck's Symphonic Variations while on a train en route to the concert, without the benefit of a piano, practicing passages in his lap. Rubinstein described his memory as photographic, to the extent that he would visualize an errant coffee stain while recalling a score. Rubinstein also had exceptionally developed aural abilities, which allowed him to play whole symphonies in his mind. "At breakfast, I might pass a Brahms symphony in my head," he said. "Then I am called to the phone, and half an hour later I find it's been going on all the time and I'm in the third movement." This ability was often tested by Rubinstein's friends, who would randomly pick extracts from opera and symphonic scores and ask him to play them from memory. Rubinstein's autobiography contained two volumes: My Young Years (1973); and My Many Years (1980). Many were displeased by their emphasis on personal anecdotes over music. Pianist Emanuel Ax, one of Rubinstein's greatest admirers, was profoundly disappointed by reading My Many Years: "Until then," he told Sachs, "I had idolized Rubinstein—I had wanted to have a life like his, the book changed all that." In a reflective muse, Rubinstein once noted "It is simply my life, music. I live it, breathe it, talk with it. I am almost unconscious of it. No, I do not mean I take it for granted—one should never take for granted any of the gifts of God. But it is like an arm, a leg, part of me. On the other hand, books and paintings and languages and people are passions with me, always to be cultivated. Travel too. I am a lucky man to have a business which allows me to be on the road so much. On the train, the plane, I have time to read. There again, I am a lucky man to be a pianist. A splendid instrument, the piano, just the right size so that you cannot take it with you. Instead of practicing, I can read. A fortunate fellow, am I not?" Of his youth, Rubinstein once said: "It is said of me that when I was young I divided my time impartially among wine, women and song. I deny this categorically. Ninety percent of my interests were women." At the age of 45, in 1932, Rubinstein married Nela Młynarska, a 24-year-old Polish ballerina (who had studied with Mary Wigman). Nela was the daughter of the Polish conductor Emil Młynarski and his wife Anna Talko-Hryncewicz, who was from a Polish aristocratic heraldic family of Iłgowski coat of arms. Nela had first fallen in love with Rubinstein when she was 18, but married Mieczysław Munz, another Polish-American pianist, after Rubinstein began an affair with an Italian princess. Nela subsequently divorced Munz and three years later married Rubinstein. They had five children (one died in infancy), including photographer Eva Rubinstein, who married William Sloane Coffin, and son John Rubinstein, a Tony Award-winning actor and father of actor Michael Weston. Nela subsequently wrote Nela's Cookbook, which included the dishes she prepared for the couple's legendary parties. Both before and during his marriage, Rubinstein carried on a series of affairs with women, including Lesley Jowitt, the wife of the British politician William Jowitt, and Irene Curzon. In addition to fathering a daughter (South American pianist Luli Oswald) with the Italian marchioness Paola Medici del Vascello (née Princess Paola di Viggiano), he may have been the father of American decorator and artist Muriel Draper's son Sanders Draper, who died in World War II. Though he and Nela never divorced, in 1977, at age 90, he left her for Annabelle Whitestone, then 33 years old. While he was an agnostic, Rubinstein was nevertheless proud of his Jewish heritage. He was a great friend of Israel, which he visited several times with his wife and children, giving concerts with the Israel Philharmonic Orchestra, recitals, and master classes at the Jerusalem Music Centre. In 1949, Rubinstein—who lost family members in the Holocaust—along with other prominent musicians (including Horowitz and Heifetz) announced that he would not appear with the Chicago Symphony if it engaged the conductor Wilhelm Furtwängler, who had remained in Germany during the war and who had performed a symphony for Hitler's birthday. Throughout his life, Rubinstein was deeply attached to Poland. At the inauguration of the United Nations in 1945, Rubinstein showed his Polish patriotism at a concert for the delegates. He began the concert by stating his deep disappointment that the conference did not have a delegation from Poland. Rubinstein later described becoming overwhelmed by a blind fury and angrily pointing out to the public the absence of the Polish flag. He stopped playing the piano, told the audience to stand up, including the Soviets, and played the Polish national anthem loudly and slowly, repeating the final part in a great thunderous forte. When he had finished, the public gave him a great ovation. Rubinstein was active in supporting charities throughout his life. He performed charity concerts to raise donations for numerous organizations which interested him. In 1961, he performed ten recitals in Carnegie Hall to raise roughly $100,000 for charities including Big Brothers, United Jewish Appeal, Polish Assistance, Musicians Emergency fund, the National Association for Mental Health, and the Legal Defense Fund of the National Advancement of Colored People. In his youth, as a natural pianist with a big technique, Rubinstein practiced as little as possible, learning new pieces quickly and without sufficient attention to textual details, relying on his personal charm to conceal the lack of finish in his playing. But his attitude toward his playing changed after his marriage. He stated that he did not want his children to take him as a has-been, so he began in the summer of 1934 to restudy his entire repertoire. "I buckled down back to work—six hours, eight hours, nine hours a day." he recalled in 1958. "And a strange thing happened. ... I began to discover new meaning, new qualities, new possibilities in music that I have been regularly playing for more than 30 years." In general, however, Rubinstein believed that a foremost danger for young pianists is to practice too much. Rubinstein regularly advised that young pianists should practice no more than three hours a day. "I was born very, very lazy and I don't always practice very long," he said, "but I must say, in my defense, that it is not so good, in a musical way, to overpractice. When you do, the music seems to come out of your pocket. If you play with a feeling of 'Oh, I know this,' you play without that little drop of fresh blood that is necessary—and the audience feels it." Of his own practice methods, he said, "At every concert I leave a lot to the moment. I must have the unexpected, the unforeseen. I want to risk, to dare. I want to be surprised by what comes out. I want to enjoy it more than the audience. That way the music can bloom anew. It's like making love. The act is always the same, but each time it's different." For Rubinstein's notable students, see List of music students by teacher: R to S § Arthur Rubinstein. Rubinstein was reluctant to teach in his earlier life, refusing to accept William Kapell's request for lessons. It was not until the late 1950s that he accepted his first pupil, Dubravka Tomšič Srebotnjak. Other pupils of Rubinstein include François-René Duchâble, Avi Schönfeld, Ann Schein Carlyss, Eugen Indjic, Janina Fialkowska, Dean Kramer and Marc Laforêt. Rubinstein also gave master classes towards the end of his life. "I have found that if you love life, life will love you back..."
"People are always setting conditions for happiness... I love life without condition." Rubinstein died in his sleep at his home in Geneva, Switzerland, on 20 December 1982, at the age of 95, and his body was cremated. On the first anniversary of his death, an urn holding his ashes was buried in Jerusalem—as specified in his will—in a dedicated plot now dubbed "Rubinstein Forest" overlooking the Jerusalem Forest. This was arranged with Israel's chief rabbis so that the main forest would not fall under religious laws governing cemeteries. In October 2007, his family donated to the Juilliard School an extensive collection of original manuscripts, manuscript copies and published editions that had been seized by the Germans during World War II from his Paris residence. Seventy-one items were returned to his four children, marking the first time that Jewish property kept in the Berlin State Library was returned to the legal heirs. In 1974, Jan Jacob Bistritzky established the Arthur Rubinstein International Piano Master Competition, held every three years in Israel, intended to promote the careers of young and outstanding pianists. The Arthur Rubinstein Award and other prizes are presented to the winners. The Rubinstein Competition also commissions works by Israeli composers. 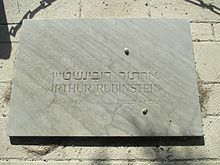 There is an Arthur Rubinstein Street in Tel Aviv, Israel. In 1910, Rubinstein recorded Franz Liszt's Hungarian Rhapsody No. 10 for the Polish Favorit label. The pianist was displeased with the acoustic recording process, saying it made the piano sound "like a banjo" and did not record again until the advent of electrical recording. However, Rubinstein made numerous player piano music rolls for the Aeolian Duo-Art system and the American Piano Company (AMPICO) in the 1920s. Beginning in 1928, Rubinstein began to record extensively for the Gramophone Company, better known as His Master's Voice in England and then RCA Victor in the US, making a large number of solo, concerto and chamber music recordings until his retirement in 1976. As recording technology improved, from 78-rpm discs to LPs and stereophonic recordings, Rubinstein re-recorded much of his repertoire. All of his RCA recordings have been released on compact disc and amount to about 107 hours of music. Rubinstein preferred to record in the studio, and during his lifetime approved for release only about three hours of live recordings. However, since his death, several labels have issued live recordings taken from radio broadcasts. Rubinstein, Arthur (1973). My Young Years. New York: Knopf. ISBN 0-394-46890-2. Rubinstein, Arthur (1980). My Many Years. New York. ISBN 0-394-42253-8. Sachs, Harvey (1995). Rubinstein: A Life. Grove Press. ISBN 978-0-8021-1579-9. 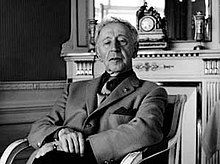 ^ a b c d e f g h i "Arthur Rubinstein Dies in Geneva at 95". The New York Times. 21 November 1982. Archived from the original on 27 August 2013. Retrieved 6 November 2011. ^ a b c Teachout, Terry (1996). "Whatever Happened to Arthur Rubinstein". Commentary. 101 (2): 48–51. ^ "Intoxicated with Romance." Time 101, no. 23 (4 June 1973): 73. ^ a b Rubinstein, Arthur (1973). My Young Years. New York: Knopf. ISBN 0-394-46890-2. ^ Rubinstein, Arthur (1973). My Young Years. New York: Knopf. p. 4. ISBN 0-394-46890-2. In later years, my manager Sol Hurok used the h-less "Artur" for my publicity, but I sign "Arthur" in countries where it is common practice, "Arturo" in Spain and Italy, and "Artur" in the Slav countries. ^ Newton, Ivor (1966). At the Piano – the World of an Accompanist. London: Hamish Hamilton Ltd. p. 44. ^ This presentation is well-documented on an audio CD edited by Joachim Kaiser, Klavier Kaiser, Sueddeutsche-Zeitung Co., Munich 2004. ^ "Pianists: The Undeniable Romantic". Time. 25 February 1966. Retrieved 25 April 2010. ^ The Rubenstein Story (as told to Clifton Fadiman), Radio Corporation of America, 1959. ^ Taylor, Angela (12 December 1983) "Nela Rubinstein: Making a Life of Her Own". The New York Times, Section B, p. 22. ^ "John Rubinstein Biography". filmreference. 2008. Retrieved April 10, 2008. ^ a b Rubinstein, Artur (1980). My Many Years. New York. ISBN 0-394-42253-8. ^ Ulanowska, Elżbieta "Na cześć Artura Rubinsteina: Pianistyczna gala w Łodzi" ("In Honor of Artur Rubinstein: Piano Gala in Łódź"), Gwiazda Polarna (The Pole Star, a Polish-American biweekly), vol. 99, no. 21 (11 October 2008), p. 18. ^ Parmenter, Ross (December 11, 1961) "Music: A Grand Finale". New York Times. 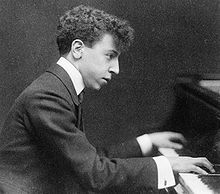 ^ "UALR Public Radio – KLRE Classical 90.5 – Pianist Arthur Rubinstein". Klre.org. Retrieved 7 January 2012. ^ "Arthur Rubinstein Remains Are Buried in Jerusalem Plot". The New York Times. Associated Press. December 22, 1983. Retrieved 27 August 2007. ^ "About". The Arthur Rubinstein International Music Society. 2012. Archived from the original on 24 April 2012. Retrieved February 18, 2012. ^ a b "Cidadãos Estrangeiros Agraciados com Ordens Portuguesas". Página Oficial das Ordens Honoríficas Portuguesas. Retrieved 20 March 2019. ^ "2007: the Year of Artur Rubinstein". Culture.pl. December 31, 2007. Retrieved November 6, 2011. ^ "Arthur Rubinstein (pianist)". Gramophone. Retrieved April 12, 2012. Wikimedia Commons has media related to Arthur Rubinstein. This page was last edited on 27 March 2019, at 14:09 (UTC).